YAVORIV, Ukraine -- The exercise, one of the most fundamental in the military handbook, came off without a hitch. A soldier carrying a length of rope and a grappling hook ran to within 20 feet or so of a coil of concertina wire and stopped. For a moment, he twirled the rope in his hands like a lasso, then threw the hook over the wire, and tugged hard, testing for explosives. When nothing happened he signaled two comrades, who ran up and started snipping the wire with cutters. Although this was a typical training exercise for raw recruits in an elemental soldierly skill, there was nothing typical about the scene. Far from enlistees, these soldiers were regulars in the Ukrainian National Guard, presumably battle-hardened after months on the front lines in eastern Ukraine. And the trainer was an American military instructor, drilling troops for battle with the United States’ former Cold War foe, Russia, and Russian-backed separatists. “It’s been a long time since I heard a target called an Ivan,” First Sgt. David Dzwik, one of the trainers, said in an interview out in the sunny forest, while observing the Ukrainians run through drills. The course on cutting wire is one of 63 classes of remedial military instruction being provided by 300 United States Army trainers in three consecutive two-month courses. Here in western Ukraine, they are far from the fighting, and their job is to instill some basic military know-how in Ukrainian soldiers, who the trainers have discovered are woefully unprepared. The largely unschooled troops are learning such basic skills as how to use an encrypted walkie-talkie; how to break open a door with a sledgehammer and a crowbar; and how to drag a wounded colleague across a field while holding a rifle at the ready. When the war began a year ago, the Ukrainian Army was all but worthless — rife with corruption and Russian spies, and made up largely of “skeleton” battalions of officers with just a few men. About 1 percent of the equipment was manufactured in the past decade. Needless to say, morale was dismal. One armored column in the early weeks of the civil war simply surrendered to a crowd of drunken local men rather than fight. At that point, the defense minister estimated that there were at best 6,000 troops from a rapid reaction unit who were actually prepared for combat, out of the 130,000-member army. Severely pressed, the government took to sending newly recruited National Guard soldiers into combat after only two months of training. They fumbled with their rifles, stumbled into traps and died from treatable wounds. “Some learn in the classroom, some on the battlefield,” Col. Sergei Moskalenko, the commander of the group now retraining at this base, said in an interview. From the earliest days of the war, the government in Kiev had asked for military help from the United States. Its request for a sophisticated antitank missile went nowhere, as Washington feared it would just encourage Russia to send more weapons and men to Ukraine. What eventually arrived was basic training. The wire-cutting drill was part of that. On a recent spring day two weeks into the course, other similarly low-tech tips were being passed on. Bewildered Ukrainian troops were being made to hoist one another on their backs, firefighter style, and run up a hill, part of an effort to improve the dismal mortality rate for the wounded. The American instructors barked simple orders — “Hurry up!” and “Keep moving!” — duly rendered into Ukrainian by interpreters. 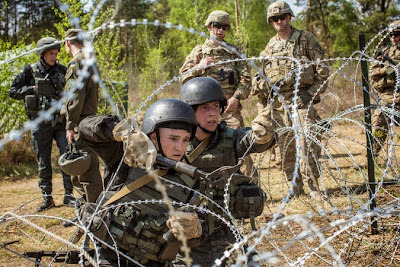 The training aims to remold the Ukrainian units by increasing the responsibilities of noncommissioned officers, fixing a Soviet legacy of an officer-heavy infantry. Without sergeants paying attention, basic mistakes were being made, the trainers said. Capt. Nicholas Salimbene, an American trainer, noticed with alarm that the Ukrainians were carrying their rifles with the safeties off. “It’s about the professionalism of the force,” he said. The Ukrainians should, too, Captain Salimbene said. The United States is also providing advanced courses for military professionals known as forward observers — the ones who call in targets — to improve the accuracy of artillery fire, making it more lethal for the enemy and less so for civilians. 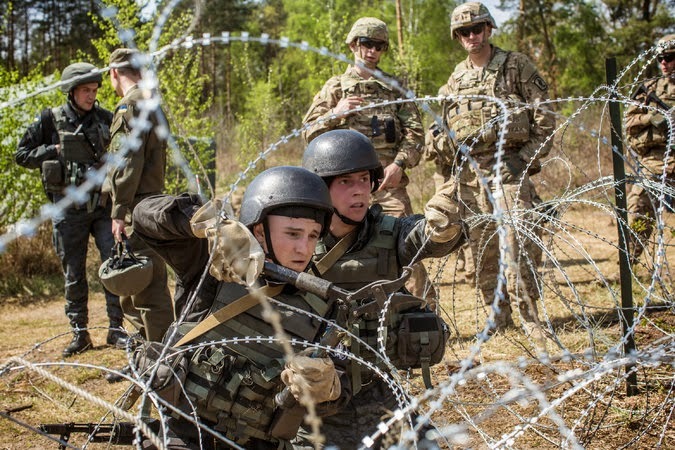 Oleksandr I. Leshchenko, the deputy director for training in the National Guard, was somewhat skeptical about the value of the training, saying that “99 percent” of the men in the course had already been in combat. “I don’t see anything new,” in the American training courses, he said. Capt. Andrii Syurkalo, a Ukrainian officer, said it was commendable that the trainers were willing to use the Abu Ghraib prisoner abuse scandal as an element in a class on the Geneva Conventions. American officers described the course work as equivalent to the latter months of basic training in the United States. The courses will train 705 Ukrainian soldiers at a cost of $19 million over six months. The Ukrainian National Guard is rotating from the front what units it can spare for the training. American instructors intend to recommend top performers to serve as trainers within other Ukrainian units, and in this way spread the instruction more broadly. In the first two weeks of training, the Americans found the Ukrainians’ soldierly skills lacking, and the group generally in need of instruction. “I came into it expecting them not to know much of the basics,” said Sgt. Michael Faranda, who is teaching maneuvers. Things “every soldier should know,” he said, they did not. Some even forgot their helmets on the first day of exercises. Still, Sergeant Faranda said, the Ukrainians’ willingness to go into combat was all the more notable for their lack of preparation for it. Shaking his head, Sergeant Faranda said had he asked one group about the Ukrainian procedure for handling a dud grenade. He was told none existed.